I have oily-combination skin that is also somewhat sensitive, so I am very careful with my facial skincare. I rarely change or add anything new to my carefully selected line-up of products, but when I do want to try something new from a brand, I usually start with a face wash. It's usually a good indicator for whether I need to bother picking up anything else from the brand. Most times, face washes aren't as expensive as face creams or serums, so I don't feel too bad if things don't work out either. 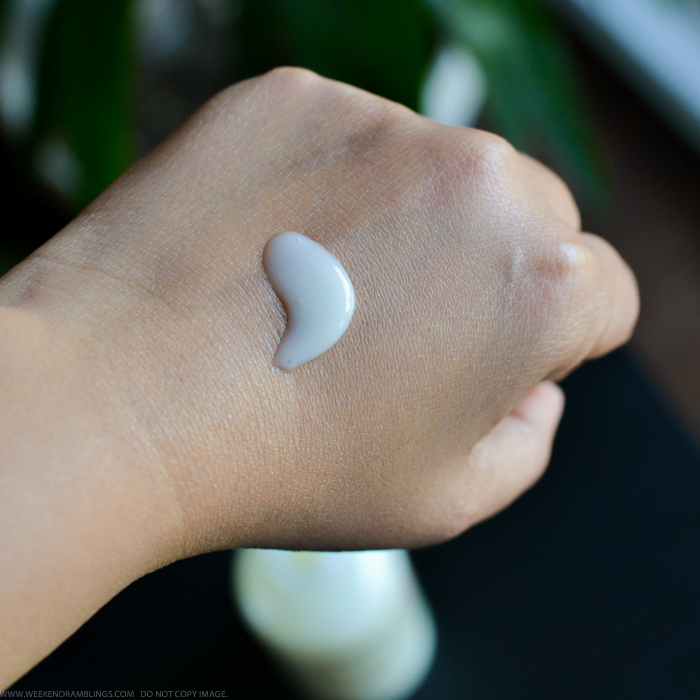 My newest skincare product testing has been the Philosophy Purity Made Simple One-Step Facial Cleanser (received courtesy of Ulta Beauty and People StyleWatch). This simple face wash claims to melt away oil, dirt, and makeup as well as tone and lightly hydrate skin in one easy step, leaving skin feeling clean and comfortably balanced. I have always been fascinated by Philosophy skincare products, mostly because I first heard about the brand on Oprah, but somehow I have never gotten around to trying anything from the brand. I love the simple, clean packaging and the positive ideas that inspire Philosophy's skincare line, but does the Purity Made Simple One-Step Facial Cleanser live up to the Philosophy skincare promise? 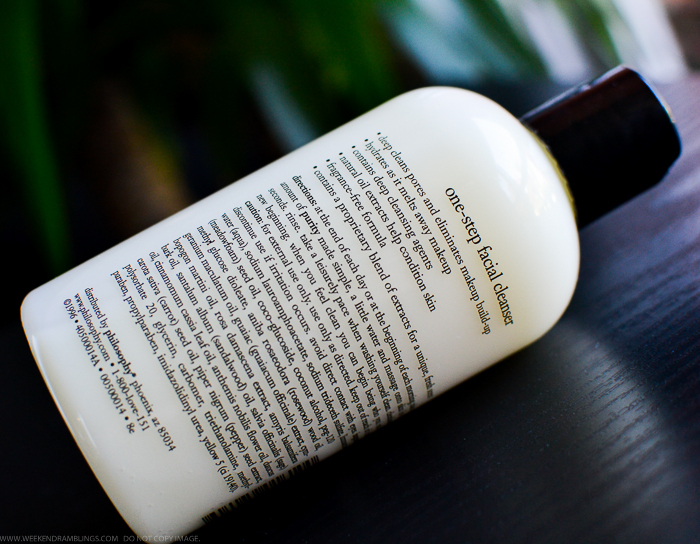 Read on for my thoughts on the Philosophy Purity Made Simple One-Step Facial Cleanser. Philosophy Purity Made Simple One-Step Facial Cleanser comes packaged in a big bottle, similar to bottles of lotions or shampoos. The dispensing mechanism is a press-flip cap, at least for the 8 fl. oz size bottle that I have, and you do need to exert a fair amount of pressure on the bottle to get the thin lotion-consistency cleanser to flow out. This product is labelled as fragrance-free, but it is not unscented - it does have a lavender-like herbal smell to it, which I assume is due to the plant extracts in the cleanser. This face wash has very mild, soft lather that rinses off quite easily without leaving any soapy/slippery residue on my face. It does a good job of leaving my skin feeling clean without making it feel too tight or dry, and I don't get any dry patches on my skin either. I do need to follow with my regular serum-moisturizer routine, of course, but I don't have to start with parched, dry-feeling skin. As far as effectiveness with removing makeup, I do not use waterproof makeup (the most stubborn makeup products I use would be UD eyeliner), and I always take off most of my makeup with a makeup remover before washing my face. but I did test this face wash on my regular makeup at the end of the day for the sake of a thorough review. The cleanser does manage to take off most of my face makeup, but I did have stubborn bits of eyeliner left behind along my lashline. If not using a makeup remover beforehand, I would definitely recommend at least double cleansing with this face wash to ensure better removal of makeup residue from the skin. With waterproof products, I wouldn't skip using a good makeup remover before using this face wash. Overall, I do love the Purity Made Simple One-Step Facial Cleanser from Philosophy. As an oily-combination skin person who has tried a lot of supposedly acne-clearing, oil-controlling facial cleansers, I firmly believe that the best face washes are those that clean without stripping skin of it's natural oils. Stripping skin's natural oils only causes skin to overcompensate and go on an oil-blemish-acne spree - or at least that's how it works with my skin. The Philosophy Purity Made Simple Cleanser strikes the perfect balance between clean skin and balanced skin. Since I don't usually exfoliate my skin using regular face scrubs, I do alternate using this cleanser with a more exfoliating facial cleansing cloth-based cleanser system to keep my skin feeling smooth and healthy. This would also make a good face wash to use during the fall-winter months when my skin is already sensitive to the lack of humidity and cold weather. Philosophy Purity Made Simple One-Step Facial Cleanser was provided for review. Disclaimer: The comments left on the blog/articles are the opinions of those who wrote it and are not to be considered as MY OPINION OR VIEWS. The comments are published in good faith, and I cannot guarantee the accuracy, completeness, honesty, etc., of the comments. Please use information contained in this blog at your own discretion, and I will not be held responsible for any loss or damages arising because of or while using this blog. COPYRIGHT © 2018 WEEKEND RAMBLINGS - ALL RIGHTS RESERVED. Powered by Blogger.